Amazing performance and stunning visuals start here. Get a smooth, seamless visual experience with a 4th generation Intel® Core i3 processor, featuring longer battery life and built-in security for deeper protection. Effortlessly move among applications with smart multitasking from Intel Hyper-Threading Technology. Experience your movies, photos, and games smoothly and seamlessly with a suite of built-in visual enhancements—no extra hardware required. Unlocked Intel Core processors, enable system tuning for the processor cores, memory, and power. Adjusting these settings provides extra performance and flexibility for more complex multimedia applications and immersive gaming. Whether you are a novice overclocker or a seasoned veteran, these processors will have you singing their praises in no time. 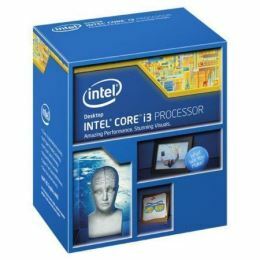 The Intel Core processor family delivers a great PC experience. Whether you are looking for improved performance, greater adaptability, or differentiated visual features, Intel has the processor to fit your needs. If you are using your PC for creativity, playing games, or everyday tasks such as homework and e-mail, these new processors make it easier to design, render, edit, play, and share. Intel Core processors feature Intel® Turbo Boost Technology 2.0, which delivers a burst of processor speed automatically when the workload demands additional performance. presentations and entertainment using Intel® Wireless Display Technology. Intel® HD graphics - Enhanced 3-D performance for immersive mainstream and casual gaming. Can support up to three UltraHD (4k) displays and collage display. Intel® Wireless Display - Wirelessly stream HD / 3-D video and games to your TV or projector for presentations and entertainment. Intel® Quick Sync Video—Delivers fast conversion of video for portable media players, online sharing, and video editing and authoring. Intel® Clear Video HD - Visual quality and color fidelity enhancements for HD playback and immersive Web browsing. Intel® InTru™ 3D - Stereoscopic 3-D Blu-ray* playback in full 1080p resolution over HDMI 1.4 and premium audio.